Complete new bigger & better scan of the same comic uploaded before. The printing is often off-center, resulting in almost no border along parts of the sides of several pages. Synopsis: A white hunter has set up a rendering plant and is indiscriminately killing men and animals to feed the vat of boiling fat. Synopsis: Simba kills an escaped circus ape. 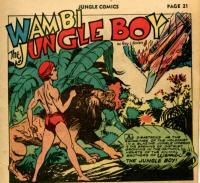 Synopsis: The jungle animals believe that Wambi is responsible for a forest fire that endangers them all. Comic Story (7 pages) The Scorpion! Synopsis: The cult of the scorpion god, Kata, comes to Khefra to establish a temple. Synopsis: Terry receives word that a nearby outpost is being besieged by Bedouins and rides with his lancers to the rescue. However, it is a trap and Terry and his men are captured and then rescued by Andy and the gang. Credits: Script: ? [as Pierre La Rue] | Pencils: Robert Webb | Inks: Arnold Hicks ? Synopsis: A white woman with a trained rhinoceros steals the idol of the Zugos. Tabu recovers the statue and returns it. Synopsis: Josephine Jordan, Camilla's cousin (unknown to both Josephine and Camilla), is in the jungle with attorney Jim Rodney to try and learn the fate of Josephine's uncle, Camilla's father. She is kidnapped by a European criminal and rescued by Camilla with help from the Obongos.